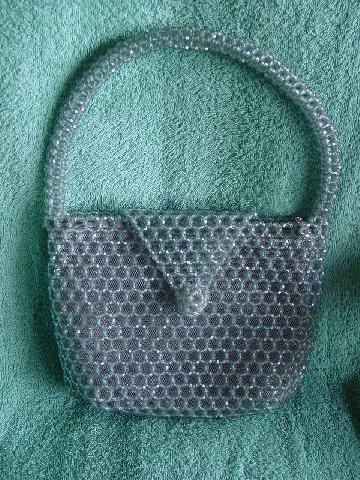 This vintage beaded purse is in a light blue with a touch of gray. It has a beaded 19" long handle, front flap, loop, and ball closure. The beads on the body of the purse are in a circular pattern with holes in their centers. It has a gray fabric lining and a top side to side zipper with a metal flower shaped pull. Eden picked it up in a boutique in Australia.